WhyWild is part of Trout Unlimited's Western Conservation Program with the purpose to engage the salmon marketplace in Trout Unlimited's wild salmon and steelhead conservation efforts in California, the Pacific Northwest, and Alaska. Through WhyWild, Trout Unlimited educates salmon consumers, chefs, retailers, seafood processors, fishermen, and others around the country about the values of wild salmon and why voting with your fork for wild salmon is a critical way of sustaining our wild salmon fisheries and ensuring that we really can have our salmon and eat it, too. 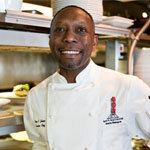 Chef Wayne Johnson (formerly of Andaluca Restaurant in Seattle) just recently joined the team at one Seattle's favorite seafood restaurants, Ray's Boathouse. Chef Johnson has been a longtime champion of Bristol Bay salmon, one of the first chefs in Seattle to feature it on his menu during past Savor Bristol Bay weeks. Passionate about unique flavors inspired by international cuisine, Chef Johnson appreciates wild salmon as an important sustainable seafood source that is iconic to Pacific Northwest cuisine. Try Chef Johnson's Bristol Bay salmon cakes recipe, featured at the Seattle screening of Red Gold in October 2011. Matt Aboussie has been bringing flash frozen, high quality Bristol Bay salmon home to Colorado for several years. In the summer, Matt and his crew operate a set net site on Ekuk Beach near Dillingham. After the fishing season Matt returns to Colorado, where his business Wild Alaska Salmon sells to customers who are interested in supporting a local fisherman who markets a sustainable product. 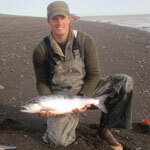 Matt is committed to promoting sustainable seafood, in his words: "Bristol Bay salmon support me, and I do my best to support them through promoting sustainably caught seafood, and high quality Alaskan salmon". Martorana Family Winery has demonstrated its commitment to land and water stewardship and its enthusiasm for protecting and restoring high-quality habitat for salmon. Located in the Dry Creek Valley in Sonoma County, the Martorana Family practices organic farming and has undertaken a whole suite of restoration projects. Most recently, the vineyard made a dramatic change in its water management for frost protection. The project serves as a model for sustainable water use and will benefit endangered coho salmon and threatened steelhead trout in the Russian River watershed. Find more about Martorana. Stay informed about what's happening in the salmon marketplace and ways you can help us protect and restore our wild salmon fisheries. 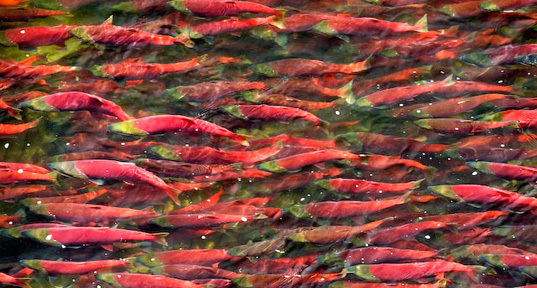 Bristol Bay Salmon coming to a restaurant near you. Trout Unlimited, Chefs Collaborative, the Bristol Bay Regional Seafood Development Association, and Sea To Table are teaming up this July to bring Bristol Bay's salmon and story to restaurants around the country. Find out which of your local restaurants are participating by going here.